Forget the so-called "impressive" E-David painting robot I previously wrote about: WaterColorBot blows it away. Why? It can paint in color, and its creator is a kid. 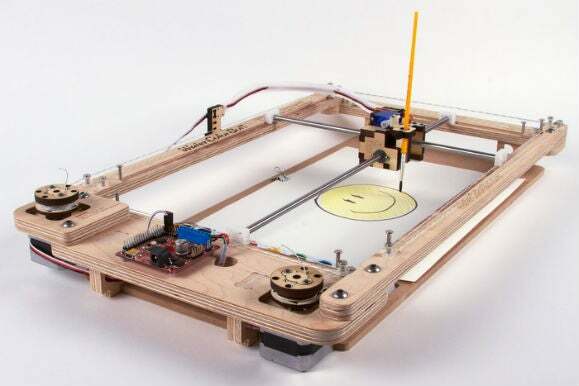 WaterColorBot by 12-year-old Sylvia Todd and Evil Mad Scientist Labs looks a bit like a wooden guillotine, but instead of slicing paper, this bot will draw you a pretty picture using digital vector art. Controlled by an EiBotBoard 2.0 USB motor controller, the brush glides across an X-Y axis to sketch and color. Ok, so the result isn't quite as artistic as E-David, but it's cute and bright. If you like it though, the creators of this open-source robot are looking for funding on Kickstarter. This story, "One kid's open-source robot will paint you a pretty picture" was originally published by TechHive.